Roundup is just really bad juju, period.
" Life is too short to drink bad beer " takes on a whole new level of meaning, here. Same for wine and other forms of hooch. What you don’t know will, in fact, kill you. Besides, America’s cheap food policy has spoiled every bit of dirt it has come into contact with. Talk about the lowest common denominator and a race to the bottom. Raise my wages to a " liveable " level and I’ll purchase the foodstuffs and drinking products that make for the good life and a healthier planet. why would anyone believe what any government statement when each agency has been awarded a “chief overseer” that is working hard to disassemble each agency. Plus each one of these jerks does their best to promote higher CO2, dioxins, promote ignorance and continue spewing pollutants everywhere. EPA ignored the water collected in Flint MI sent to then early in the Flint Water Crisis. Glyphosate is almost all of our foods for example 99% farms use glyphosate on most grain crops such as Wheat, Oats, Barley so even if you only have an occasional beer or wine that sh#t is cumulative in our bodies. Humans can consume a small amount of arsenic daily and eventually it will get you. There are too many science reports that prove the deleterious of glyphosate effects on the endocrine and nervous systems to name a few. I do not want to eat glyphosate with my meals. Thankfully I don’t indulge in beers, and if I did it would be one of the Portland locals, like Burnside/Deschutes or Breakside Breweries. And as the map clearly indicates, our area of the country uses the least amount of glysophate. I did once squirt some in my eye many years ago before understanding what it was. Not sure it is having an effect. There are many authors who have documented the ubiquitous presence of glyphosate that it is very difficult to eat foods without it. Unless we can be sure that a foodstuff is marked with the non-GMO butterfly and stamped organic we will not know what it contains. The agropetrochemical industry has been using it for decades and it has a very long life. Furthermore that same industry has refused to clearly mark foods that are genetically altered and there are much more that we know. Soybeans and corn were among the first and if you read labels you will find soybean oil and or corn oil used in many foodstuffs. The list of GMO products is quite long. It makes it hard to buy local if you’re in the US. I eat very few boxed or processed foods. I buy organic corn ships from trader joe’s and niche cereal and oatmeal. Other wise I make everything from scratch with organic produce. Deschutes tries to use as much non-GMO wheat and corn as possible, but they still use some. It’s hard not to these days. Yaay! Another perfect illustration of corporate rights. Another: Carcinogenic BpA in food packaging: yaay! Carcinogenic BpA in ATM and retail store paper receipts: yaay! ALL of it perfectly legal. It’s not just Trump trying to kill us. 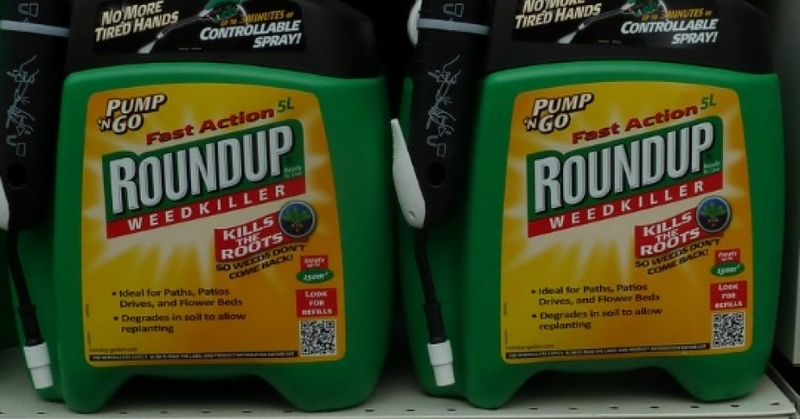 In the first case to go to trial against Monsanto over Roundup last year, a jury ruled that exposure to glyphosate had caused the non-Hodgkin lymphoma of California groundskeeper Dewayne Johnson.